Last spring we gave you a collection inspired by the kind of women you want on your side, the kind of women you want to be. You loved it, and we loved making it. And that’s why our spring fragrance collection is inspired by 9 women artists. We know you’ll love these muses and their scents just as much as we do, and we’d like to share a few of their stories. Narrowing down the artists to feature in the collection wasn’t easy, but we knew we had to include Mokarrameh Ghanbari. Not only did we fall in love with her work, but the story of how this outsider artist came to painting so late in life, and the personal challenges and cultural hurdles she overcame to pursue her art is so inspiring we had to share it with you. Forced into a marriage at a young age and never given the opportunity for an education, before she became a painter Mokarrameh Ghanbari raised nine children, farmed, and worked variously as a healer, seamstress, and makeup artist. One of three wives, by her own account her marriage was an unhappy one. (Tellingly, she never included her late husband in her paintings.) It was not until she was 64 that Ghanbari took up painting, for which she never received any formal training. Ghanbari came to painting as a way to express her feelings when her children, concerned for her health, would no longer allow her the farm work and cow herding she enjoyed. In the agrarian Caspian plains of northern Iran where Ghanbari was born and lived, women often have strong attachments to the cows for which they care. The widowed Ghanbari, then in her early sixties, spent her time caring for the cows that she loved and doing farm work, until she became very ill and had to go to Tehran for medical care. While she was sick in bed, her children, who were concerned about her health, sold the cows in order to reduce her workload. But their well-meaning act sent her into a depression. Her first painting was a portrait of one of the cows she missed so much. A friend gave her paper and colored pencil to express herself, and Ghanbari immediately began to draw obsessively. For four years, she kept her art a secret out of fear of what her neighbors would think. She was an illiterate farmer and a woman -- what right did she have to put brush to paper? She painted late at night and hid her work if anyone came into her home, lying about the paint on her hands. But her creative spirit would not be suppressed. Her work found its way onto the walls of her home, her stove, and the backs of discarded wallpaper. When he discovered her new passion, her son brought Ghanbari 50 sheets of paper and she soon covered both sides of them all, making her own paint of natural dyes when she ran out of the store-bought kind. At first, her neighbors were shocked and opposed to her newfound creative outlet. Not only was it unheard of for an uneducated farmer to paint, but strict Islam forbids the use of human figures in art. Ghandbari never felt her art conflicted with her faith. When asked about it, she said, “I didn’t go to school and I am not literate so I do not know enough, and I only looked at a few pages of the Qur’an as an inspiration, but I cannot really read the Qur’an. I don’t lie. I don’t think Islam says that drawing shouldn’t be done. 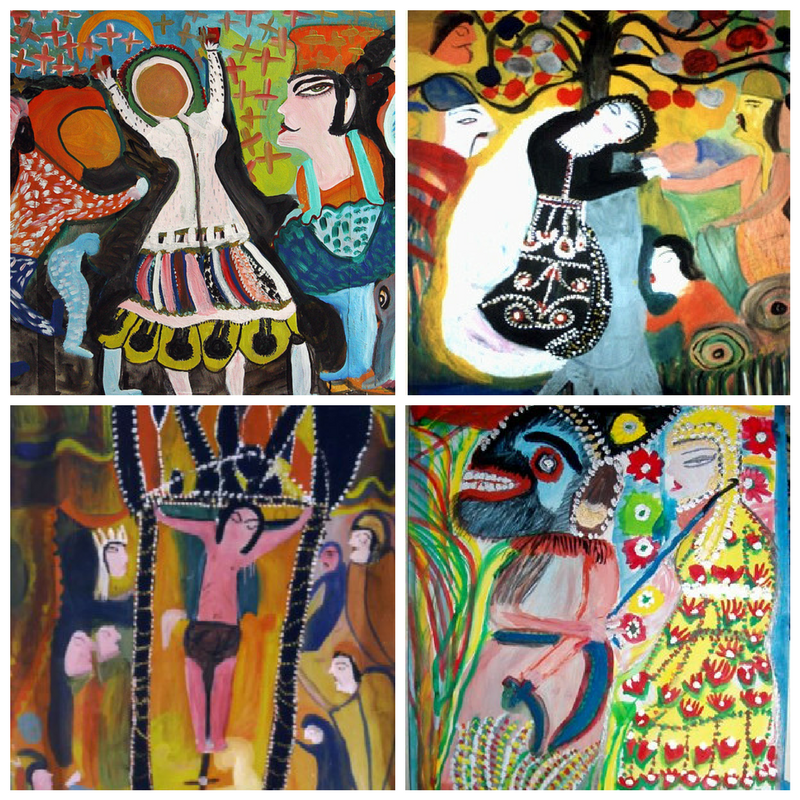 I don’t think there is anything wrong with it.”Ghandbari’s paintings, which have been compared with Chagall and look like something out of a colorful dream, are peopled with the stories that she heard told at night, stories from the Quran, the Christian Old Testament and Persian folktales. Marvelous figures peer from every corner of her small home, Adam and Eve, Jesus, and a pair of young Persian lovers mingling freely. Eventually, her fame spread and the revolutionary guards heard rumors about the paintings. They came to question her, but never stopped her. Ghanbari's colorful, dreamlike paintings drew on inspiration from stories she heard. Before she passed away in 2005 at the age of 77, Mokarammeh Ghanbari’s work won over more than just her neighbors. There was an exhibit of her work in the capital of Tehran, a documentary was made about her, and people came from across the globe to meet her. There were rumors of a Hollywood biopic. Mother Mokarrameh, as she was known, has been called “Iran’s own Picasso.” Today, her small house is a museum. And the neighbors paint their own front doors and walls, in her memory and in hopes that future artists will not go unseen. TLDR version: Not to be stopped by a forced marriage, lack of education, or societal disapproval, Mokarrameh Ghanbari picked up a paintbrush at the age of 64, and never looked back. If you’d like to know more about Mokarrameh Ghanbari, there are a limited number of English language resources. Adventure Divas by Holly Morris contains a half chapter about her, which has the benefit of including some of Ghanbari’s own words, as the author actually interviewed her. We were unable to source an English copy of the documentary by Ebrahim Mokhtari, Mokarrameh, Her Memories and Dreams, however there are two shorter videos available on YouTube: Mokarrameh Ghanbari AKA Mother Mokarrameh and Mokarrameh Ghanbari directed by Majid Mahichi. The quality isn’t great, but if you can deal with that, you’ll find a fascinating glimpse of the artist and her work.